(Nanowerk News) Scientists at the U.S. Department of Energy’s Brookhaven National Laboratory have found a new way to use a synthetic form of DNA to control the assembly of nanoparticles — this time resulting in switchable, three-dimensional and small-cluster structures that might be useful, for example, as biosensors, in solar cells, and as new materials for data storage. 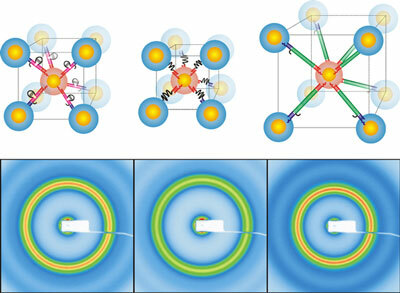 The work is described in Nature Nanotechnology, published online December 20, 2009. These illustrations show how a 3-D crystal made from nanoparticles changes between two distinct states via an intermediate structure (top row, middle) when looped (left) versus unlooped (right) double-stranded DNA chains are used to link the particles. The scientists were able to measure the distance between the particles in each structure by recording x-ray scattering patterns (bottom row). Switching from looped to unlooped DNA increased the interparticle distance by about 6 nanometers. “Now we’re using a special type of DNA-linking device — a kind of ‘smart glue’ — that affects how the particles connect to make structures that are switchable between different configurations,” says Gang. This reliable, reversible switching could be used to regulate functional properties — for example, a material’s fluorescence and energy transfer properties — to make new materials that are responsive to changing conditions, or to alter their functions on demand. Such responsiveness to changes in environmental conditions and the ability to adopt new forms are hallmarks of living systems. In that way, these new nanomaterials more closely mimic biological systems than any previous nanostructures. Though far from any form of truly “artificial life,” these materials could lead to the design of nanoscale machines that, at a very simple level, mimic cellular processes such as converting sunlight into useful energy, or sensing the presence of other molecules. Responsive materials would also have benefits in the field of optics or to produce regulated porous materials for molecular separations, Gang says. “Many physical characteristics of nanomaterials, such as optical and magnetic properties, are strongly dependent on the distance between nanoparticles,” Gang explains. “Our hope is that the ability to induce post-assembly reorganization of these structures by adding DNA or other molecules as external stimuli, and our ability to observe these changes with nanometer resolution, will help us understand these processes and find ways to apply them in new kinds of nanomachinery in which the system’s functionality is determined by the nanoparticles and their relative organization,” says Gang. Future studies will make use of precise imaging capabilities, such as advanced electron microscopy tools at the CFN and higher-resolution x-ray techniques that will become available at Brookhaven’s new light source, NSLS-II, now under construction. Gang’s collaborators on this work include Brookhaven colleagues Mudalige Kumara, Dmytro Nykypanchuk and William Sherman, as well as Mathew Maye, a former Brookhaven chemist now at Syracuse University. The research was funded by the DOE Office of Science, by a Laboratory Directed Research and Development grant, and by a Goldhaber Distinguished Fellowship. Brookhaven Science Associates, which manages Brookhaven Lab, has filed patent applications related to this work. For information about these patents and licensing opportunities, contact Kimberley Elcess, [email protected], 631 344-4151. Upon publication, the paper will be available at: http://dx.doi.org/10.1038/NNANO.2009.378.